As much as he appreciates the Bombardier Q400’s sophisticated flight deck technology, Horizon Air Captain Rob Sandberg quite enjoys stepping back in time. He can often be found at the controls of World War II fighter aircraft, flying for a worthy cause close to his heart. For the past seven years, the Seattle-based pilot has been a member of the Condor Squadron, a Los Angeles-based nonprofit group that preserves and flies AT-6 aircraft at military funerals, sports team games, airshows and other community events. Founded in 1965 by a group of World War II fighter pilots, the squadron’s mission is to remember and honor those who’ve flown for the U.S. military. For his efforts, Sandberg was recently named the 2014 winner of the Spirit of Community Caring Award, the highest honor that can be bestowed on an Alaska Air Group employee for volunteer work. He was introduced to the Condor Squadron in 2007 through one of his dad’s buddies. Sandberg serves on the squadron’s board of directors and is also its director of flight operations. His duties include coordinating flyovers and ensuring the squadron’s flying members (about a dozen, ranging in age from 27 to 80) are fully qualified to operate the AT-6s in formation flying. On March 8, the squadron flew in a standard “missing man” formation above the funeral for Walter Ehlers, the last surviving Medal of Honor recipient from the D-Day invasion. Last December, Sandberg organized a memorial for members of the Women Airforce Service Pilots (WASPs), a group of civilian female pilots who flew military aircraft under the direction of the U.S. military during World War II. After the event, Sandberg and his fellow members took four of the surviving women – the youngest of whom was 90 – flying in the AT-6s. 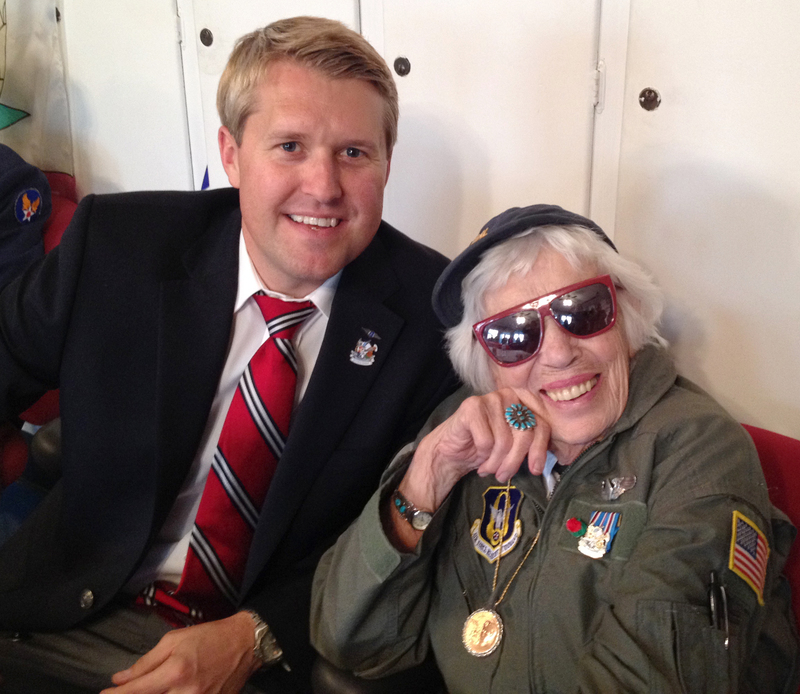 Sandberg with Jean McCreedy, a member of a World War II women’s military pilot group that Sandberg’s Condor Squadron honored in December 2013. Sandberg with McCreedy inside an AT-6, ready for takeoff. 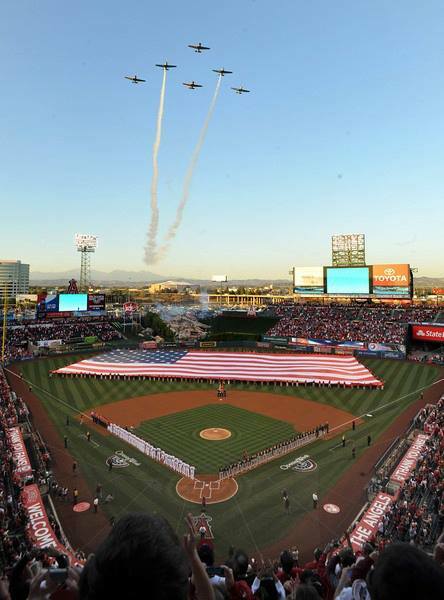 The squadron’s flyovers are also a mainstay of airshows, parades and a handful of professional sporting events, including a Los Angeles Dodgers playoff game last fall and several Los Angeles Angels home openers. 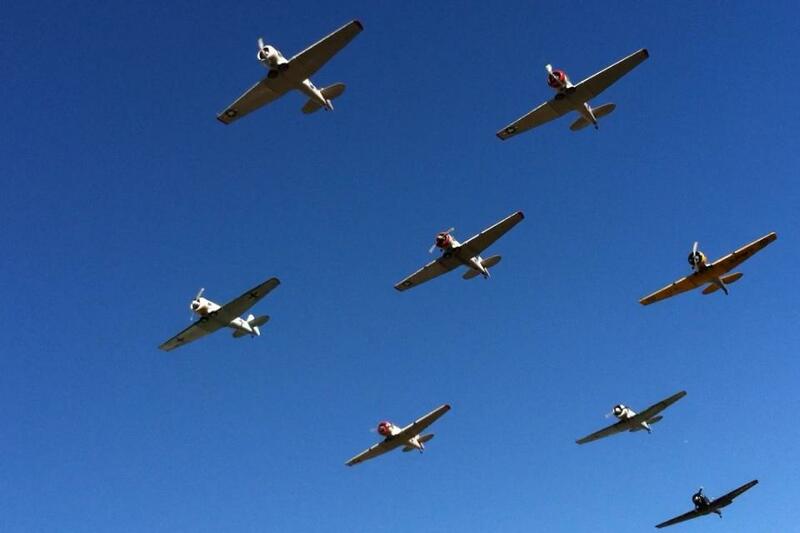 The Condor Squadron performs a flyover at the Los Angeles Angels’ 2013 home opener. “That 2011 flyover came after three years of bugging them, but now we’ve been a staple at Angels games for four years, and we’ll be at several games this year,” he says. The Condor Squadron also strives to educate. It maintains two museum sites in the Los Angeles area – one at its home base at Van Nuys Airport, and another at the Folded Wings Shrine to Aviation, located at the Valhalla Memorial Park Cemetery in Burbank. Several “light bulb” opportunities are coming July 4, when the Condor Squadron will be flying over eight different Independence Day parades and celebrations in the Los Angeles area. For more details, and a full rundown of future appearances, visit the Condor Squadron website. Alaska Air Group has supported the Condor Squadron since 2013. 2 comments on "Flying in a time capsule to honor veterans"